Apologies for the blog silence — I headed home for that baby shower (taking an unfinished booty with me), and then took a brief trip to see my grandmother out of state, and then got back here on Tuesday morning to work on a grant application. Whew! Finished that yesterday, and blogging is at the top of today’s non-work to-do list. Here’s an iPhone shot of the second booty, just before kitchenering, and then the pair, just before wrapping. My cousin seemed to really like them at the shower — let’s hope the baby does, too! I haven’t done any knitting since finishing these on Saturday morning, maybe because I don’t have any knitting that is both portable and free of charts or counting. 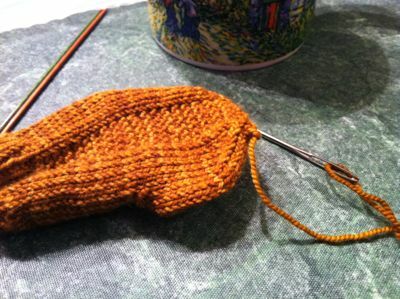 I should probably fix that by casting on for something new for me, like socks, though I certainly have lots more baby and wedding gifts to knit over the next several months. And here’s a shot of the lake. The fall color has been absolutely stunning this year, but even so, the transition to winter is sort of exciting because of the way my view is changing. 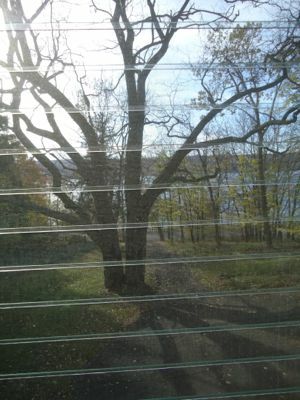 Now that the leaves have mostly fallen, I can see the lake even from my perch on the couch in the family room. I am so pleased with how this turned out. 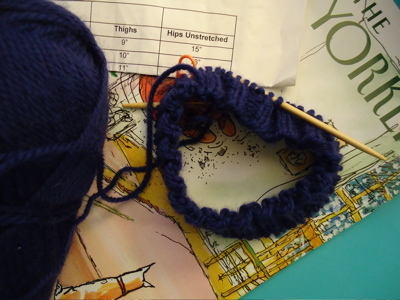 After a few false starts — once because I wasn’t happy with the stitch count (it looked too big) and once because I twisted my knitting when I joined it in the round (what? I haven’t done that in years!) 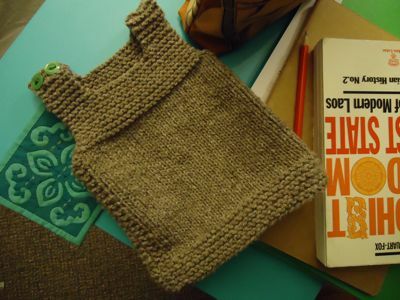 — I got into a rhythm and just knit-knit-knit to get this done in time for Sunday’s shower. 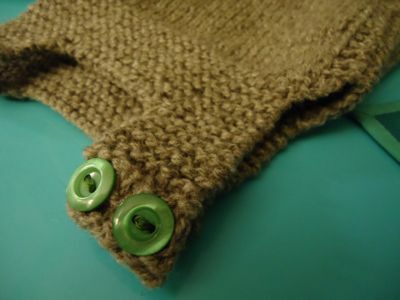 I made some modifications based on other projects on ravelry: used worsted-weight yarn and size 7 needles, CO 70 st, made the garter stitch sides 5 st, and knit in the round with buttons only at the shoulder, rather than all the way up the side. I used more of the elsa wool cormo from my idlewood (maybe just over half a skein? ), and oh my goodness, do I ever love this yarn. Squishy, woolly, and absolutely gorgeous. Snowy and lovely outside. Off to campus! Whoa. This week totally got away from me. 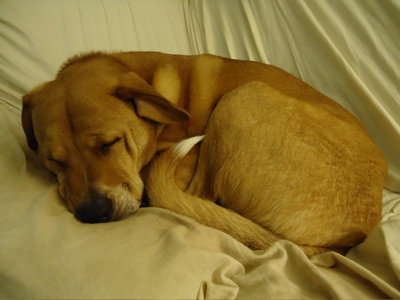 Last night I realized that I haven’t blogged since Tuesday! Consider today’s post a rather disjointed “show and tell” from the week. A homemade treat from my friend M. She’s already finished with her comprehensive exams. Isn’t it beautiful? 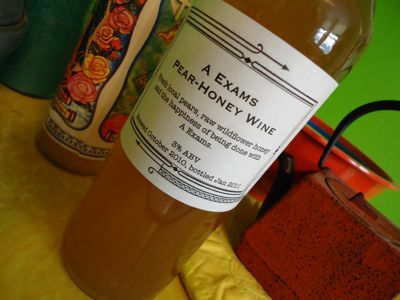 I can’t wait to try this pear-honey wine (also known as liquid encouragement). 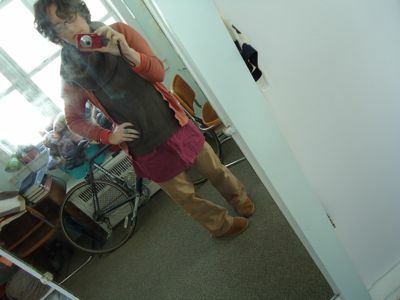 No handknits in this picture, but one of those accidental outfits that somehow made it out the door. I like all the pinks and purples. 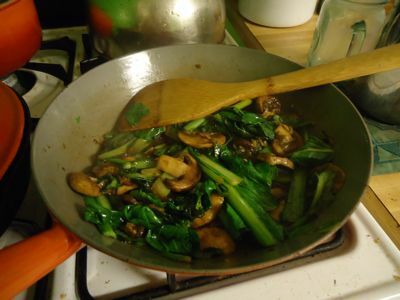 Mushrooms and komatsuna sauteed in a balsamic vinaigrette. I ate this over fresh spinach from the farm. A winter treat, to be sure. Friday night. late. 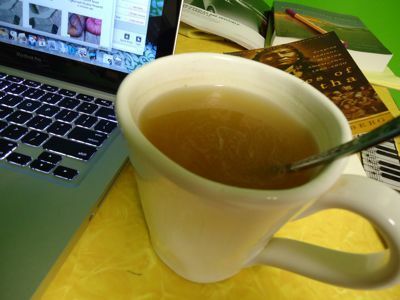 A hot toddy to keep me company while taking notes. So good. 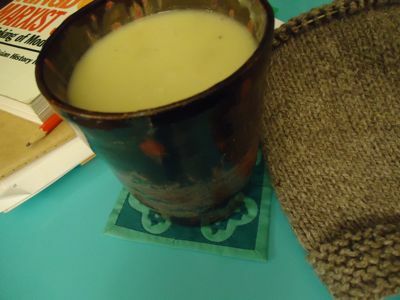 Parsnip soup (with maple syrup and mustard) in a favorite mug. Baby-shower knitting. And reading. The shower is today, so I’ll post less cryptic pictures soon! sweetness, a soaker, and first sweaters. 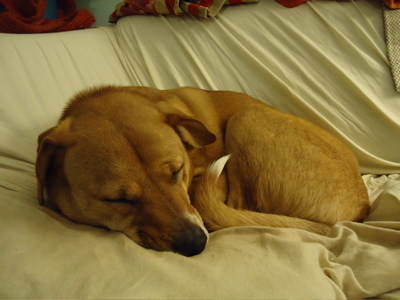 This dog has been such a comfort to me this week — a mixture of silly and sweet. 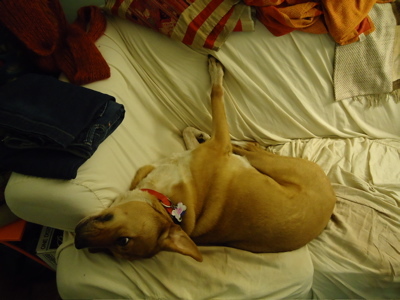 Last night when I got home from a reading group, we played a game where I told him to sit, walked five paces, turned around and said, “Come on!” and he raced towards me. I think I got tired before he did. 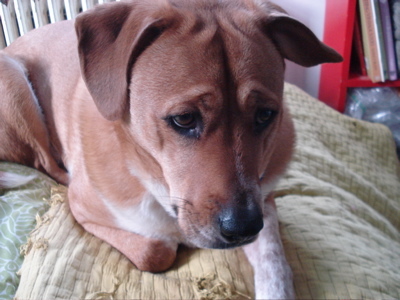 Dogs know when you’re having a hard time, and I am so thankful for Boh’s company right now. I’m almost embarrassed to show you this — the beginning of a soaker that I started six weeks ago. 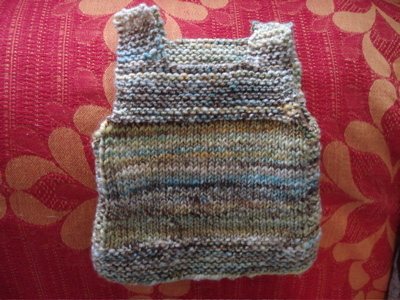 It has succumbed to the curse of my in-the-bag knitting. It seems like I never actually work on the project I take everywhere. I can’t explain it. 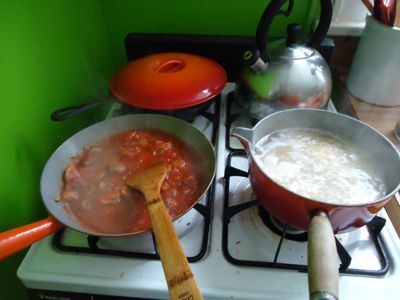 I started this alongside my dear friend T, who is expecting. (Yay!) We began them together, with the idea that I could help with troubleshooting if anything came up. 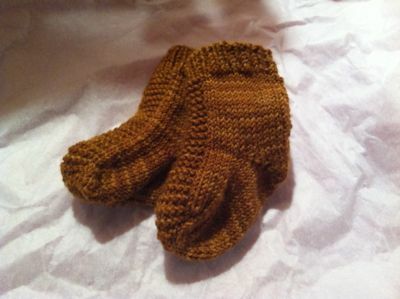 T. has already made close to half a dozen of these sweet soakers, while I’m still knitting the ribbing of my first. (For shame.) At least I still have a few months before she’s going to need this! I was talking with my friend P. yesterday about sweater-knitting — she called me on the way home from a yarn shop, her first sweater’s worth in the backseat. 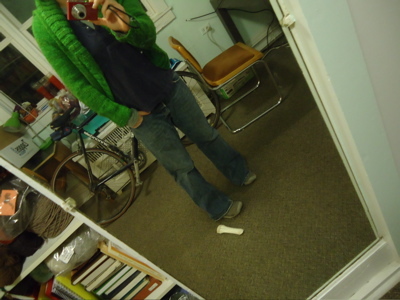 And as I bundled up to head out for a reading group last night, I grabbed my first sweater. 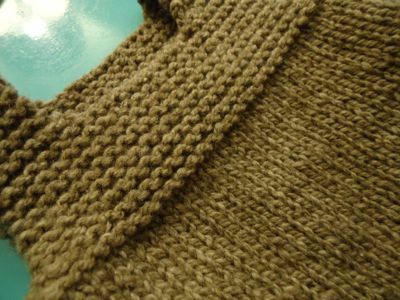 The seaming is completely wonky, the ends are woven in weirdly, the size isn’t quite right…but I LOVE this sweater. 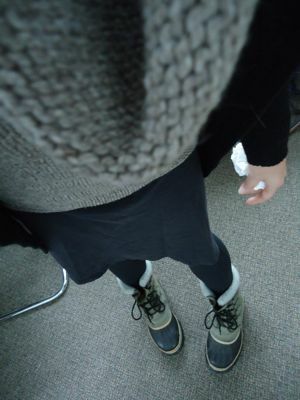 Together with thrift-store boy jeans over long-underwear and a couple of long-sleeve layers, it was the answer to single-digit December temps — and to the transition I’m coping with right now. 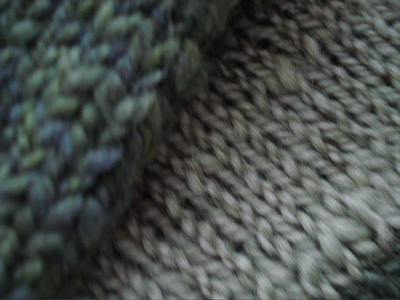 Handknits are magical like that. 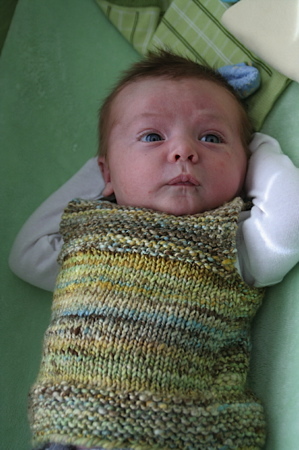 Babies in handknits are adorable — but you know what is even better? The baby of dear friends, wearing something I made for him. LOVE. 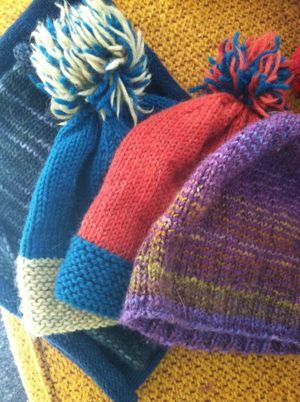 I looked at a lot of different baby hats to get a sense for the number of stitches to cast on, and then used the Thorpe pattern as a guide. 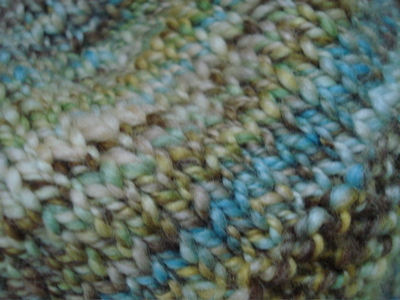 I used every last scrap of that FLUFF superwash merino handspun in Beach Day to finish binding off the hat. Whew! 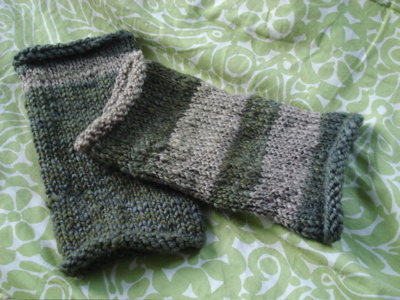 I also wanted to make something soft and cozy for Chunk’s mom, A, so I got out the leftovers from two of the seaman’s caps I knit this fall and crossed my fingers that there would be enough yarn to make a pair of toast mitts. The handspun makes the gauge and color changes a bit wonky, but these are supersoft, and exactly the kind of thing I wanted to tuck into this package. These treats arrived in the Southwest on Wednesday, and I cannot wait to see how handsome Chunk looks in his new handspun duds. Also — I’ve taken a bit of a digital vacation these last few days, so my apologies in advance if I don’t manage to motivate myself to take some finished photos of my mom’s Multnomah. I think I managed 5 repeats of the feather and fan lace. I’m quite pleased with how it turned out, even though I had to wrap it at 11 pm on Christmas Eve. I’ll be back to see my parents in January, and I’m intending to give it a good blocking then. Boh and I are heading back to our bright green kitchen in the morning — more soon! 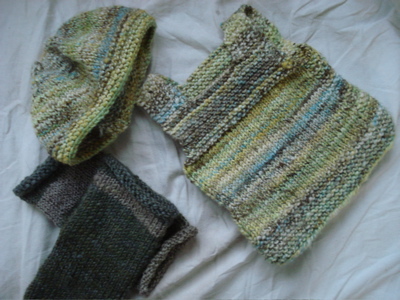 Handspun handknits for mom and baby. Real pictures once the package makes its way west. Also, this guy says hi. Hope your week is off to a good start!